I love homeschooling and being with my kids. Once in a while, though, I wish that I could do something I did in public school: get a sub. Prior to kids, I just had to write a lesson plan, call the administrator in charge of subs, and climb back into bed to sleep until I felt better. Something is better than nothing. Any small thing you do that increases your child’s knowledge is important. It could be discussions about a TV show, going over memory work, or a Saxon worksheet. (Feel free to skip the meeting book once in a while, elementary moms!) Do you remember in public school what you did when you had a sub? Something you did not need the teacher’s help with, or sometimes busy work. Find something your child can do without your help (if your child is a pre-reader, you may want to have them color something or watch a short video). Read a book! 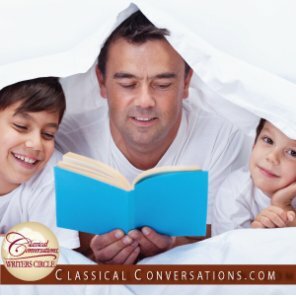 Climb into bed with your kids and read a fun book. It does not have to go with the cycle you are in or even remotely relate to school (I know, I want everything to match the cycle and be of supreme educational value too). Just the fact you are reading to them is increasing their listening ability. If you have no voice or are really sick, get a recorded book! The library usually has them (and mine even has electronic recordings that I do not even have to go to the library to get). Then the whole family gets to hear and enjoy the book. If for some reason you are going in and out of consciousness (e.g., flu-induced sleep), have your students retell that part to you. If you are just tired of the routine of school, take a break from the grind. Take a field trip. Do school outside or at the library. Build a volcano. Watch Magic School Bus or Liberty Kids. Any break from the norm might increase motivation and productivity! I have found that the more I stress out, the less I get done in the long run. God’s grace in our schooling is sufficient. As long as we are trying to increase our students’ knowledge daily, even in small ways, we are closer to our educational goals.